The first Peace Conference of the Ahmadiyya Muslim Association (Tooting Chapter) was held on the 22nd November 2015 at the Lola Jones Hall, Tooting Leisure Centre. Condemning the Paris terror attacks in Paris and Bamako, the Ahmadiyya Muslim Community held the event in Tooting to promote peace, to unite religions in peace and to tackle extremism. Shakeel Ahmed, President of the Ahmadiyya Muslim Association (Tooting Chapter) said in his welcoming speech, “Islam encourages interfaith dialogue and advocates peace, tolerance, love and understanding among the followers of different faiths. We firmly believe in the Quranic teaching that ‘there is no compulsion in religion’. It is our firm belief that we must work together for a greater cause of peace, putting aside minor differences. I’m sure that we can achieve unity without disarray, diversity without division, and be one worldwide community without hatred, oppression, poverty and war. This event has one purpose, which is for us to come and sit together in a friendly environment to talk about one goal and shared objective that we hold, which is to promote love, affection, brotherhood and peace. 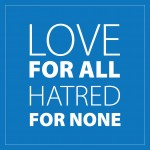 The ethos of our community is summed up in our motto: love for all, hatred for none.” Wandsworth Borough Commander DCS Richard Smith said, “These events strengthen the resolve of our local communities to promote tolerance, kindness and understanding between people of all backgrounds and beliefs in order to build a safe and secure world for everyone. Terrorism and hatred can never triumph whilst we continue to strive to work together for the benefit of everyone. “As a police officer, I urge all of you to be vigilant, to report anything suspicious to the authorities, and to work with us to keep this great city safe. I wish you great success with your campaign for peace and hope that you have a safe and enjoyable evening.” Councillor Nicola Nardelli Mayor of Wandsworth said, “It is also important that we stand united in solidarity. We need compassion for those who have suffered loss, fear and emotional upset in these recent vile atrocities, and also for those still suffering around the world. At times like this it is important to think about all the things that unite us, that bring us together and make us stand side by side. We cannot solve all the world’s problems, but by showing that we care and value those around us, we can send out a message to the world that we are together and we are united.” Keynote speaker Mr Mansoor Shah, vice president of the Ahmadiyya Muslim Community UK echoed the message of the worldwide head of the Ahmadiyya Muslim Community, condemning the recent terror attacks. He reiterated that Islam is a religion of peace and tolerance, stating that the faith is opposed to all forms of terrorism and extremism. About 140 people from different faith and non-faith groups attended the evening, including Leader of Wandsworth Council, Ravi Govindia, local councillor Rex Osborn, Conservative Parliamentary Spokesman for Tooting Dan Watkins and Transition Town Tooting co-founder Hilary Jennings.